June Butcher, Lauren Riendeau, Pauline Hewitt and Faye Deery (top) and a baby woylie and its mother (above). After taking in seven woylies from Tutanning woodland last August, the centre’s executive chairwoman June Butcher this week confirmed all four females were carrying newborn joeys. She said the breeding program, developed in partnership with the Department of Environment and Conservation, was an official success. ‘The good result has come from teamwork and awareness of what small marsupials like woylies need in order to survive,’ she said. Once a thriving feature of the Australian bush, the nocturnal woylie is now found in just four isolated locations in southwest WA. Ms Butcher said much research has been conducted on the cause of woylies’ drastic population decline over the past decade. She said the cause might be multiple converging factors such as habitat fragmentation and loss, drought, disease and predation by feral cats and foxes. DEC principal zoologist Manda Page said breeding programs were vital to sustain critical populations of endangered species. ‘I congratulate the carers at Kanyana for their success ” woylies are sensitive and getting them to settle down and start breeding is a fantastic achievement,’ Dr Page said. 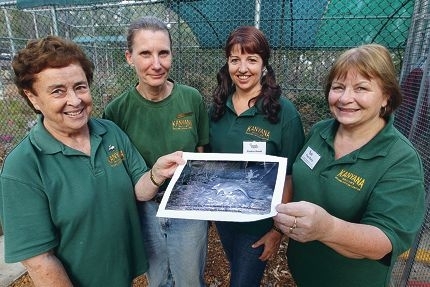 In addition to its captive breeding program, the volunteer-driven Kanyana Wildlife Rehabilitation Centre cares for sick and injured animals and runs wildlife education and training.